New gardeners are often at a loss when it comes to choosing easy to grow plants. They see fantastic combinations in magazines or on the web and feel that the exotic offerings are all that is available to them. Often new gardeners live in an apartment with very little space for plants, or they have a shady balcony where blooming plants struggle. 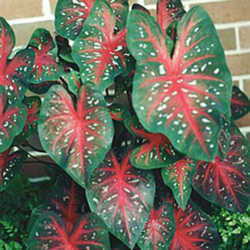 Caladiums can give them bright colors in the shade and they are very easy to grow in most areas. Caladiums are native to South and Central America and were discovered by Europeans in 1773. They quickly became popular hothouse plants in Europe and breeders soon developed varieties with larger and brighter leaves. They like warm, damp, shady conditions during their growing season and dry conditions when they are dormant. Gardeners in frost-free zones can leave their caladium tubers in the ground all year if they are planted in a well-drained area and gardeners in cold weather zones either lift their tubers in the fall to store indoors over winter or treat them as annuals. Personally, that's what I do because caladium tubers are cheap and there are many great vendors that ship world-wide. Caladiums are happy container plants. They like lots of water and a dressing of bone meal half-way through the season, but that's about it. They do not benefit from applications of Miracle-Gro®, as the high nitrogen content of that fertilizer tends to promote green leaves and the colors won't be as bright. Caladiums are very undemanding. I always have a huge display each summer on my east-facing front porch. I plant the tubers about 3" deep (7.6cm) each spring in the containers, as soon as there is no chance of frost. However, they can be started several weeks earlier indoors if you have an area where the containers can languish until they can safely go outdoors. Plant a number of tubers in each pot to make for a fuller show. The containers on my porch are large and I usually plant between 10 and 15 #1 size tubers in each pot. Caladiums are sold in several grades, and the #1 Jumbos give the biggest show, but I've also used the smaller ones sold in those cheap big box store bags with great results; it just takes more of them to fill a huge pot. 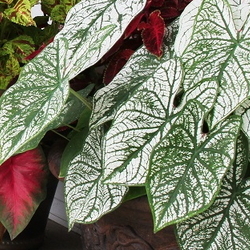 Caladiums pair well with coleus, impatiens, trailing begonias and ferns if you prefer mixed containers. 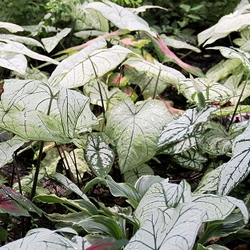 Some gardeners like to plant caladiums in the ground with their shady garden plants. They brighten up dark corners and give a basic woodland palate a tropical feel. My cousin has a B&B where we fill his shady beds with caladiums each spring and they provide a maintenance-free show for him each year. Caladiums require very little work since their show comes from the leaves. There's no dead-heading or pruning so busy gardeners can keep a lovely show by watering. The more sunlight your area has, the more water they will need and they can even do well with several hours of direct sunlight each day as long as their moisture needs are met. My front porch is in the full morning sun for several hours, but bright shade after about 10:00 AM. 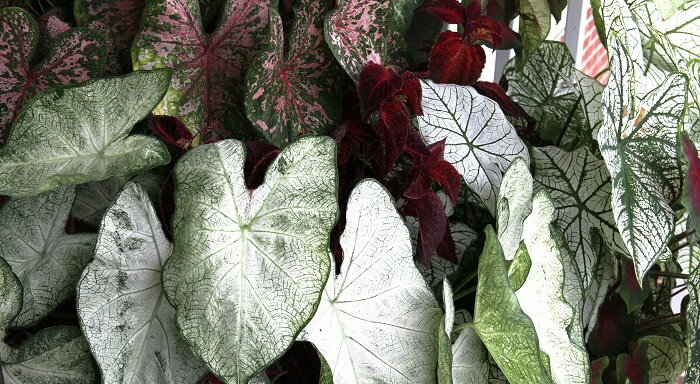 Caladiums look much more exotic and difficult than they really are, and actually make fun indoor plants too. Just remember that they do have a dormant season, even indoors, so when your indoor caladiums die back, let the pots dry and store them in an unused area for a couple of months. Outdoors, they like hot summer days and warm summer nights, so gardeners with those conditions (regardless of skill level) should give them a try. Caladiums are enexpensive and easy to obtain. If you have a hard time finding them for sale in your area, our Garden Watchdog directory lists these companies that will be happy to ship some to you. As you can see from the many comments, a large number of our members do just that. (including myself) They will make your containers and gardens shine!